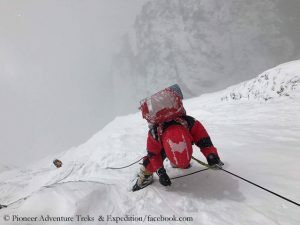 Also the second summit attempt of the South Korean Sung Taek Hong and the Spaniard Jorge Egocheaga on the South Face of the 8,516-meter-high Lhotse in Nepal has apparently failed. Even though they were not able to reach the summit of Lhotse, “they made a safe climbing and finally they all are back safely,” writes Lakpa Sherpa, managing director of “Pioneer Adventure Treks & Expedition” on Instagram. The Nepalese operator had deployed four Sherpas for the South Korean expedition. A confirmation by the South Koreans is still pending, as well as the information, how far up Sung Taek Hong and Co. climbed this time in the wall and why they allegedly turned around.